Gait training is an important rehabilitation exercise that requires large space and support. To help it succeed, we developed an automatic speed-controlled treadmill with a sensor frame. A Microsoft Kinect sensor detects the user’s legs, measuring step length and stride width. Leg information is used to control treadmill belt speed. Force sensors in the sensor frame measure support force and its center. Gait analysis using these values is discussed without including treadmill speed control. Subjects were healthy young males aged 22 to 23. Step length indicates the suitable belt speed for a subject. In experiments with automatic belt-speed control, the controller adjusts belt speed automatically based on how a user walks. T. Kikuchi, K. Sakai, and K. Ishiya, “Gait Analysis with Automatic Speed-Controlled Treadmill,” J. Robot. Mechatron., Vol.27, No.5, pp. 528-534, 2015. S. Saxena et al., “Dementia: a public health priority,” WHO, p. 2, 2012. P. Heyn, B. C. Abreu, and K. J. Ottenbacher, “The effects of exercise training on elderly persons with cognitive impairment and dementia: A meta-analysis,” Archives of Physical Medicine and Rehabilitation, Vol.85, No.10, pp. 1694-1704, 2004. A. F. Kramer, S. Hahn, N. J. Cohen, M. T. Banich, E. McAuley, C. R. Harrison, J. Chason, E. Vakil, L. Bardell, R. A. Boileau, and A. Colcombe, “Ageing, fitness and neurocognitive function,” Nature, Vol.400, No.6743, pp. 418-419, 1999. S. J. Colcombe, K. I. Erickson, P. E. Scalf, J. S. Kim, R. Prakash, E. McAuley, S. Elavsky, D. X. Marquez, L. Hu, and A. F. Kramer, “Aerobic exercise training increases brain volume in aging humans,” J. of Gerontology Series A: Biological Science and Medical Science, Vol.61, No.11, pp. 1166-1170, 2006. A. Timinkul, M. Kato, T. Omori, C. C. Deocaris, A. Ito, T. Kizuka, Y. Sakairi, T. Nishijima, T. Asada, and H. Soya, “Enhancing effect of cerebral blood volume by mild exercise in healthy young men: A near-infrared spectroscopy study,” Neuroscience Research, Vol.61, No.3, pp. 242-248, 2008. C. E. Gleason, R. E. Gangnon, B. L. Fischer, and J. E. Mahoney, “Increased Risk for Falling Associated with Subtle Cognitive Impairment: Secondary Analysis of a Randomized Clinical Trial,” Dement Geriatric Cognitive Disorders, Vol.27, pp.557-563, 2009. 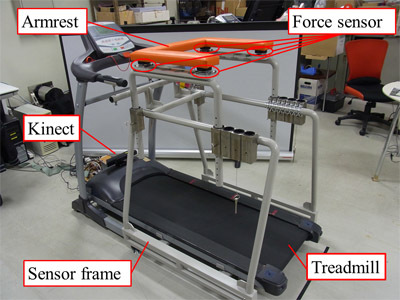 T. Ando, E. Ohki, Y. Nakashima, Y. Akita, H. Iijima, O. Tanaka, and M. G. Fujie, “Pilot Study of Split Belt Treadmill Based Gait Rehabilitation System for Symmetric Stroke Gait,” J. of Robotics and Mechatronics, Vol.24, No.5, pp. 884-893, 2012. E. W. Miller, M. E Quinn, and P. G. Seddon, “Body Weight Support Treadmill and Overground Ambulation Training for Two Patients With Chronic Disability Secondary to Stroke,” Physical Therapy J. of the American Physical Therapy Associataion, Vol.82, No.1, pp. 53-61, 2002. S. Hussain, S. Q. Xie, and G. Liu, “Robot assisted treadmill training: mechanisms and training strategies,” Medical Engineering & Physics, Vol.33, No.5, pp. 527-533, 2011. R. Constantinescu, C. Leonard, C. Deeley, and R. Kurlan, “Assistive Devices for Gait in Parkinson’s Disease,” Parkinsonism & Related Disorder, Vol.13, No.3, pp. 133-138, 2007. E. Auvinet, F. Multon, C. Aubin, J. Meunier, and M. Raison, “Detection of gait cycles in treadmill walking using a Kinect,” Gait & Posture, Vol.41, No.2, pp. 722-725, 2015. M. Gabel, R. Gilad-Bachrach, E. Renshaw, and A. Schuster, “Full body gait analysis with kinect,” Proc. of 34th Annual Int. Conf. of the IEEE Engineering in Medicine and Biology Society, 2012. E. E. Stone and M. Skubic, “Passive in-home measurement of stride-to-stride gait variability comparing vision and kinect sensing,” Proc. of 33th Annual Int. Conf. of the IEEE Engineering in Medicine and Biology Society, 2011. B. E. Maki, “Gait changes in older adults: predictors of falls or indicators of fear,” J. American Geriatrics Society, Vol.45, No.3, pp. 313-320, 1997. T. Kikuchi, T. Tanaka, A. Shoji, S. Tanida, and M. Kato, “Gait measurement system to develop control model of intelligently controllable ankle-foot orthosis,” Proc. of the 2011 IEEE/SICE Int. Symposium on System Integration, pp. 124-129, 2011. M. P. Foldey, B. Prax, R. Crowell, and T. Boone, “Effect of Assistive Device on Cardiorespiratory Demands in Older Adults,” Physical Therapy, Vol.76, No.12, pp. 1313-1319, 1996. V. Inman, H. Ralston, and F. Todd, “Human walking,” Williams & Wilkins, 1981.